Daiso goodies! I bought a ridiculous amount of crap, which can be seen here, so be prepared to be bombarded by things that only cost $1.50. I can't be blamed, at that price. 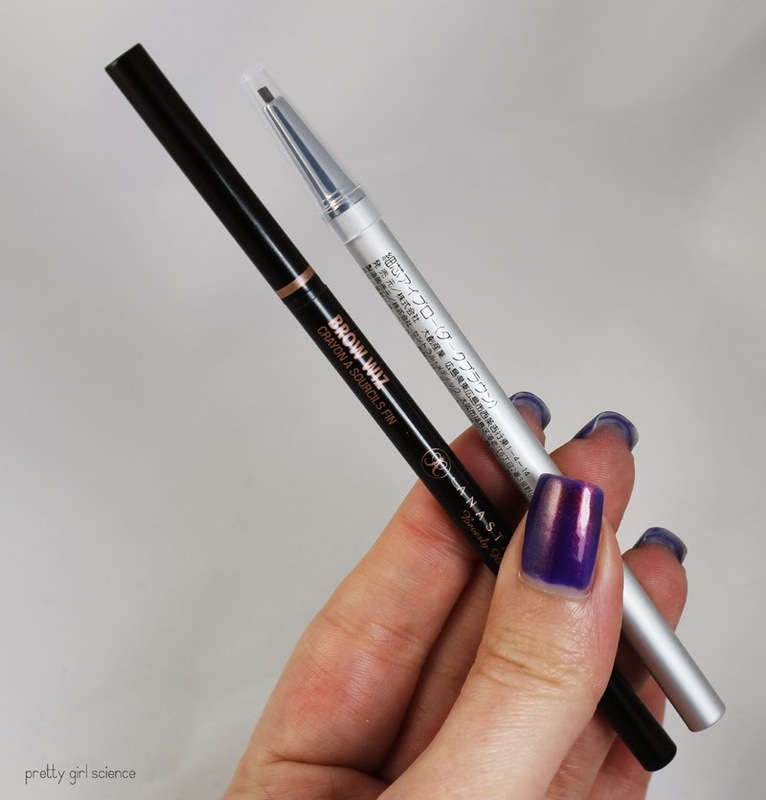 One of the first things I grabbed when we got there was this brow pencil. 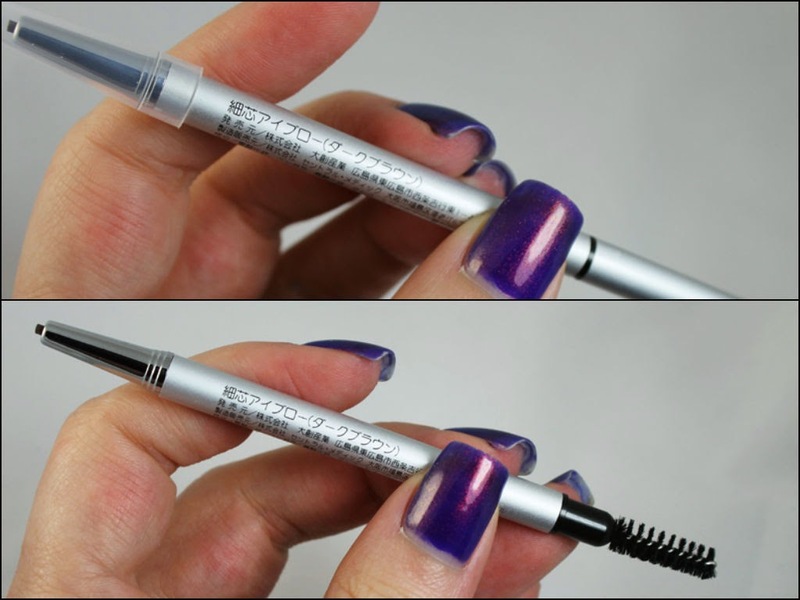 It looks a lot like my Anastasia Brow Wiz, but at a fraction of the price. If it worked for me, I would gladly drive up there when I needed replacements. I am always looking for dupes these days. Of course, I had never heard of this brand...nor can I read the writing on the package. But the English bits said "brow pencil" and "dark brown", so I was in. Plus, it was so cheap that I wouldn't really be out all that much if it didn't work out. Which it didn't...it was far too warm for my hair color. I know tons of people who have warm brown hair though, and I bet they can give this a good home. 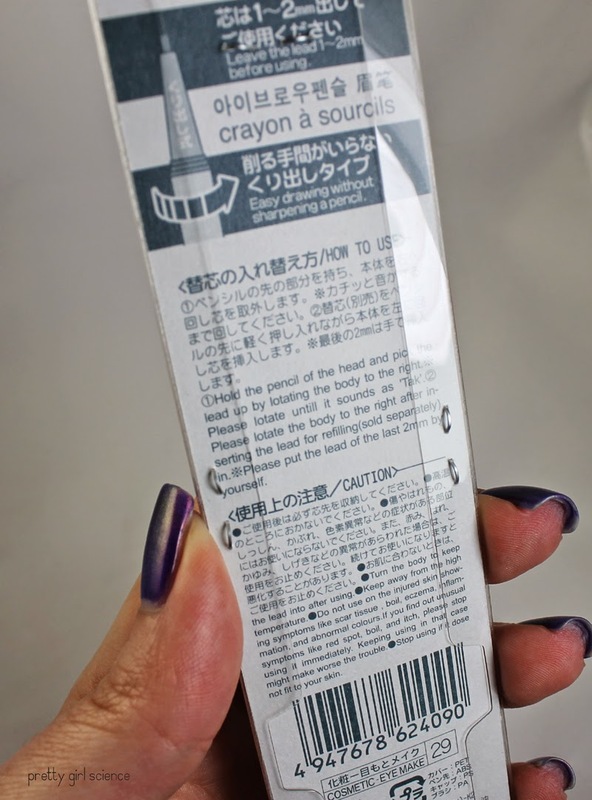 Like the Brow Wiz, it has a good fine point and a spoolie on the back end. I am able to draw a good fine line with this pencil, though it is quite dry. 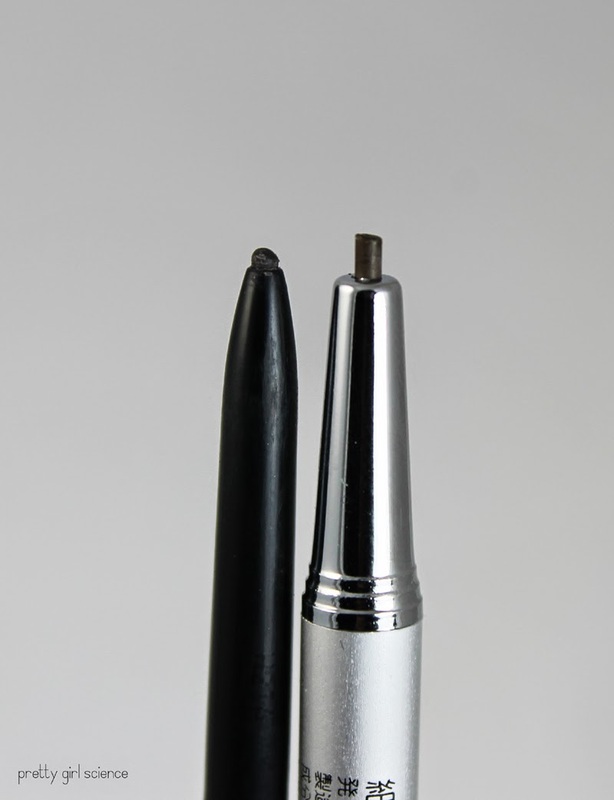 I wonder if wearing down the edges would make it easier to apply, as the fresh sharp tip is a little bit of a pain to use. The spoolie on the end is perfectly serviceable, though it isn't as dense as the one on the Brow Wiz. It still combs brows up, and blends product out...just not as well. I chose the color dark brown, but I really ought to have grabbed black. My hair is on the cool side of dark brown, and this pencil is quite warm. I think a red head would do quite well with this brand, since all the colors I saw (except black) were pretty warm. I think, next time, I will grab the black pencil. If it is a warm black, I might be able to make it work. 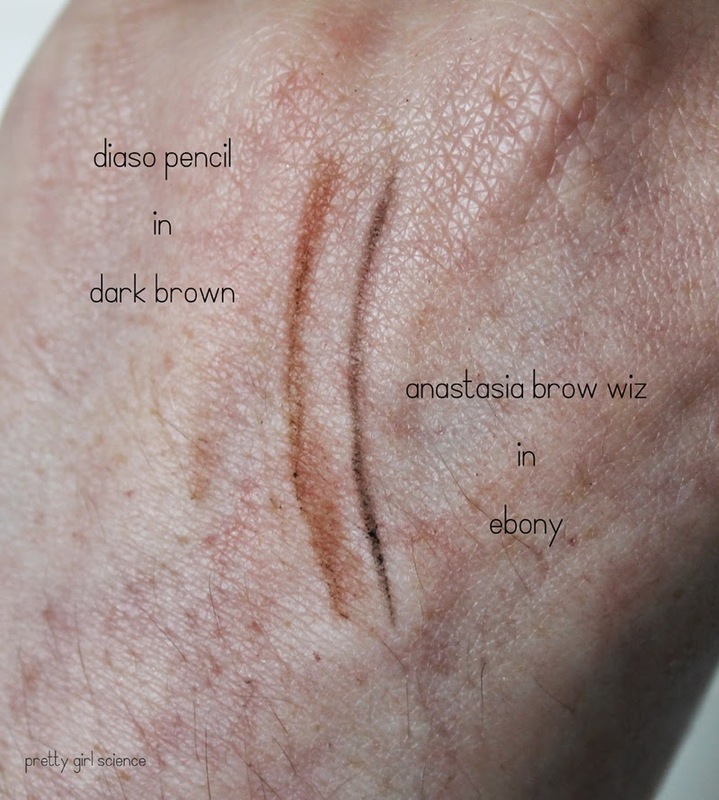 The Daiso pencil is also kinda dry and under pigmented at first blush. To make the mark on the back of my hand, I had to go over it a few times. 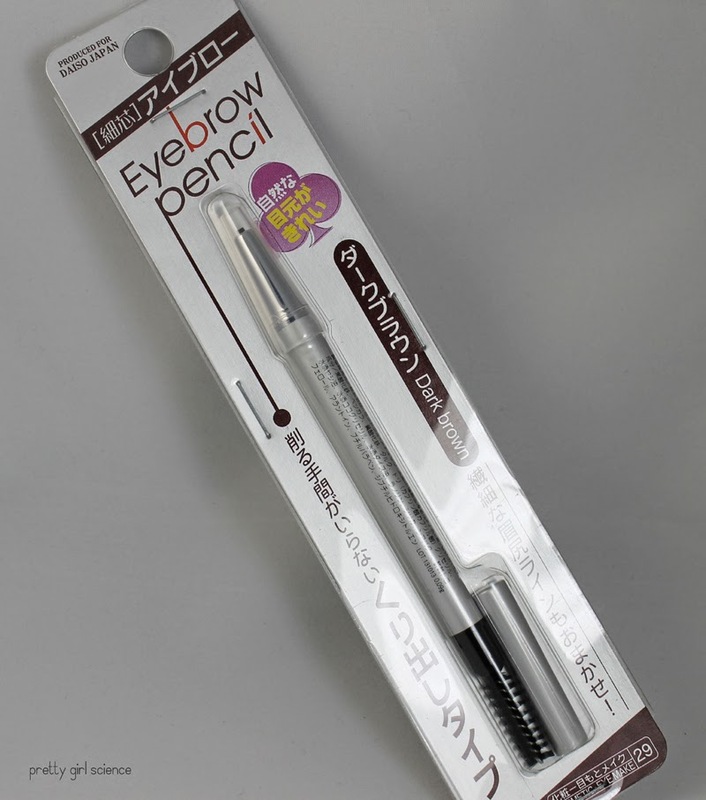 I was worried that this would mean that it wouldn't work well on my brows, but thankfully it performed wonderfully. 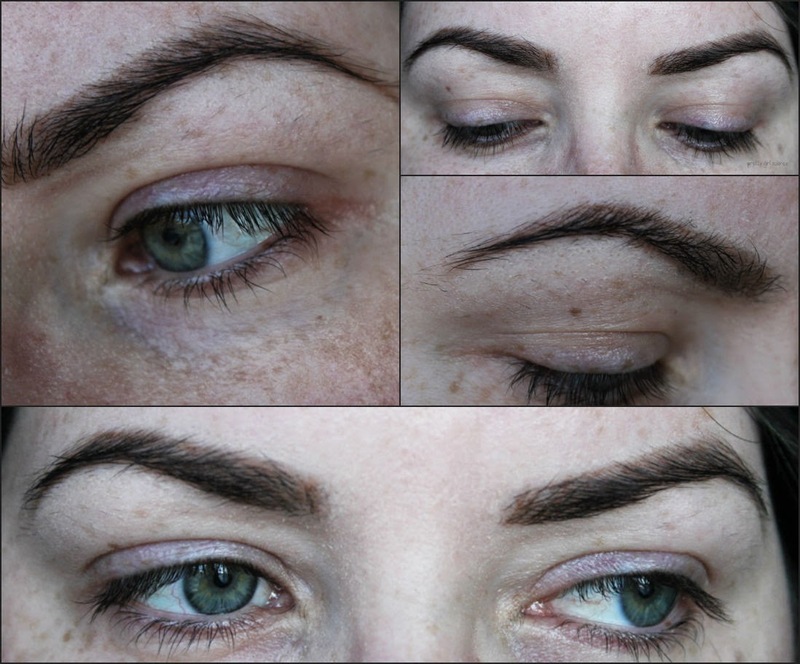 It drew nice, even lines through my brows without having to press very hard. I would say this is pretty much a dupe for the Anastasia, formula wise. I wish that there was a bigger color range though...but for $1.50, I'm not complaining. they look like they should be dupes. And now on my face. Ignore how tired I look. The plague is hard. It doesn't look so bad on my actual face. It is definitely warmer than I would choose, but its not so bad that I feel completely weird wearing it. I think that for someone who has chocolatey colors in their hair, this would work wonderfully.